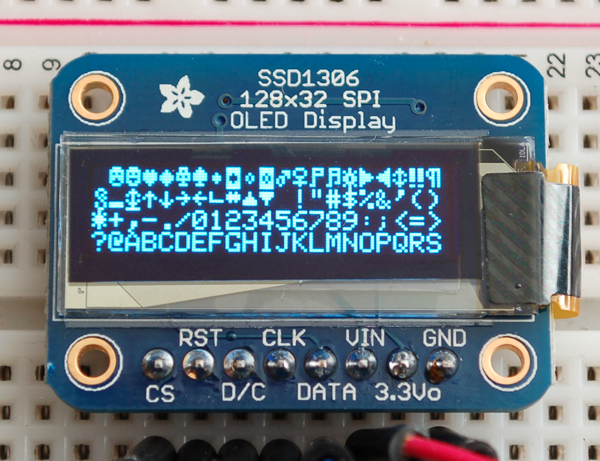 Controlling an Adafruit SSD1306 SPI OLED with a Raspberry Pi #piday #raspberrypi @Raspberry_Pi « Adafruit Industries – Makers, hackers, artists, designers and engineers! Adafruit’s lovely little 128×32 monochrome SPI OLED module uses a SSD1306 driver chip (datasheet), and Adafruit have published excellent tutorials and libraries for driving this from an Arduino. When asked in their forum about Raspberry Pi support, Adafruit have said that there is a huge backlog of libraries to port to the RasPi and (they) don’t have any ETA on the SSD1306. it only supports pixel and text drawing functions (no geometric drawing functions). The driver chip SSD1306, communicates via SPI only. 4 or 5 pins are required to communicate with the chip in the OLED display. Of course, we wouldn’t leave you with a datasheet and a “good luck”: We have a detailed tutorial and example code in the form of an Arduino library for text and graphics. You’ll need a microcontroller with more than 512 bytes of RAM since the display must be buffered.